Michigan Farm To School - Blog: Register now for Edible Flint's 10th Annual Food Garden Tour! Register now for Edible Flint's 10th Annual Food Garden Tour! Join edible flint as we celebrate Flint’s food gardens, hoop houses and farms at the 10th Anniversary edible flint Food Garden Tour! This special event will feature local gardeners, explore different gardening techniques and highlight all of the healthy produce grown in the City of Flint. This event will also celebrate all the gardeners, gardens and community partners that have made the edible flint Food Garden Tour and local food movement so special over the past 10 years. 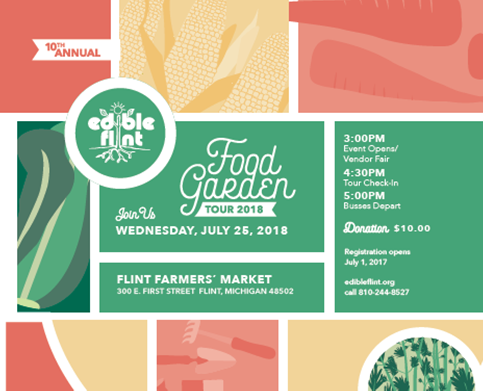 This edible flint event will be held Wednesday July 25, 2018 at The Flint Farmers’ Market from 3 pm- 8 pm. The edible flint 10th Annual Food Garden Tour kicks-off with a Pre-Tour Community Partners in Health Fair, featuring local farmers and organizations dedicated to healthy lifestyles and gardening in Genesee County. This 10th Annual Food Garden tour offers 3 different routes for participants, you can choose from 1 of 2 bus routes or can select to tour by bike. After the tour, participants return to the Flint Farmers’ Market for good food, good music and great fun! Registration is open, and the fee is $10, which covers the costs of buses and food. Interested persons can visit edibleflint.org or call (810) 244-8527 for more information or to register. Seats are limited so reserve yours now!! !